In 2006 the Lord called me to return to Mississippi and move to Jackson—my mission field, my Jerusalem— after graduating from Duke Divinity School. This word came to me at the end of a silent retreat I was required to attend. For nearly 19 hours I prayed, walked, and read Scripture and spiritual books without saying a word out loud, wondering when or how God would speak to me. In that twentieth hour God gloriously spoke to my Spirit, flooding me with illumination into how He had ordered my life up until that very hour. It was humbling. And it was the confirmation I needed because I never wanted to move back to Mississippi. Growing up here I had dreams of making a life in New England. And during my first few months in Durham, NC, I fell in love with the area, thinking Raleigh or Charlotte would be great places to call home. But with each passing year in divinity school God made it clear that all roads were leading me back to the Magnolia State. I reluctantly obeyed. It has been six years since I returned home in 2009. God has blessed me to be a blessing in myriad ways. I am filled with gratitude for the great things He has done and continues to do. It has not been easy; I’ve experienced disappointments and setbacks while here. But who doesn’t? Indeed Jackson is my Jerusalem. Through it all I trust that God is still up to something. I feel it in my bones. One thing that burdens me is that, by God’s grace, Jackson will be an epicenter of statewide and national revival, as it once was more than a century ago. Since coming back I’ve heard mayors and everyday people talk about Jackson’s potential: what we are and can be. We’ve been called a City with Soul, the Best of the New South, a Destination City, One City with One Aim and Destiny, the Bold New City. City with Soul stays with me even though there have been two mayors since him. City with Soul was what we were being called when I moved here in ’09 and I believe it speaks to the “big idea” of what we are and we can become. Becoming a bold, new, destination city has a lot to do with the Soul that pulsates in our capital city. What stands out to me more than anything else is the way the black church in Jackson has particularly contributed so richly to religion around the world. I have the honor of pastoring Mt Helm Baptist Church. As Jackson’s oldest historically African American congregation, we are celebrating 180 years this year. During a recent lecture at the Mississippi Department of Archives and History Calvin White Jr., assistant professor of history at the University of Arkansas and author of The Rise of Respectability: Race, Religion, and the Church of God in Christ, autographed his book for me with a note that contended I “now hold one of the most historic pulpits in the history of African American religion.” Wow! About 120 years ago Charles Price Jones, Mt Helm’s fifth pastor, partnered with Charles Harrison Mason and other Baptist ministers to host a Holiness Convention at our historic church. Many were delivered, healed, and sanctified at Mt Helm over the course of many days. A Spirit-filled revival broke out there. The Lord was glorified. After some turbulent tensions, first between Mt Helm and Jones and later between Jones and Mason, the Church of God in Christ and the Church of Christ (Holiness) USA (headquartered in Jackson) were born. Jones, known as the father of black Holiness, was an accomplished hymnist and many of his songs are sung in black and white churches across denominations (including the National Baptist Convention USA, from which he was expelled for his “strange” doctrine). Of course, the Church of God in Christ is one of America’s largest denominations and has churches around the world. All of this began in Jackson, MS.
Dr. Jerry Young, pastor of New Hope Baptist Church (Watkins Drive), is now the 18th President of the National Baptist Convention USA, Inc. He is the first native Mississippian still residing in Mississippi to lead America’s largest black Christian denomination. By God’s grace, he will prove to be one of NBCUSA’s greatest reformers. He, his family, and the church he loves are all here in Jackson. 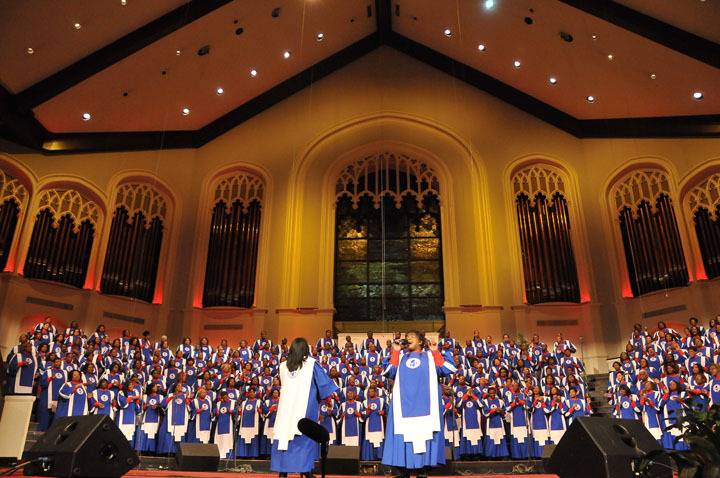 The Mississippi Mass Choir, whose soulful Gospel music has blessed saints around the nation and the world, is headquartered in Jackson. They are a Mississippi and national treasure. Regional headquarters for the Seventh Day Adventist Church, African Methodist Episcopal Church, and Christian Methodist Church are here in Jackson. The state headquarters for the Mississippi Southern Baptist Convention, the Episcopal Church of Mississippi, the Mississippi Conference of the United Methodist Church, and the Mississippi Church of God are here too. And we have a Catholic diocese and a state jurisdiction of the Church of God in Christ. Educationally, there are two accredited seminaries in Jackson: Reformed Theological Seminary and Wesley Biblical Seminary. The Mississippi Baptist Seminary and Bible College has long served underprivileged black clergy and lay leaders and continues to offer biblical and theological education for churches through our state. Jackson State University, once housed at Mt Helm Baptist Church and College Hill Missionary Baptist Church, respectively, has roots in the Baptist church. Tougaloo College, Millsaps College, Belhaven University, and the Mississippi College School of Law, all housed in Jackson, are religiously rooted institutions of higher learning expanding minds and serving local and global communities. Mission Mississippi and the John M. Perkins Center are here. Perkins, now in his 80s, is the well beloved grandfather of Christian community development and has led white and black believers from around the world to justice and reconciliation ministry right from his Jackson living room. The local Trinity Broadcasting Network airs from Jackson. Our churches, hotels, Convention Complex, and Coliseum host regional, national, and global Gospel artists and religious conferences, conventions, convocations, and strategy meetings. I’m sure there is more to be said. The half has not been told. I’m looking forward to seeing how this City with Soul will be the kind of spiritual epicenter where everyone wants to come and no one wants to leave. By being the best of who we are called to be spiritually, we will indeed be the best of the New South. It can be done because Jackson is our Jerusalem. Lord, revive us again! How we approach our preaching responsibility depends upon whether we consider proclamation of the gospel to be a matter of life and death. […] If we look upon ourselves as heralds of the great King […] to the hearts of human beings of that upon which turns the eternal health or the fatal sickness of people their private and corporate lives, then we shall see our work as preachers as something else again. Preaching, Taylor urges, is a matter of life and death. All else in Taylor’s preaching and pastoral vocation flowed from his deep devotion to the life, death, resurrection, ascension, and second coming of the Lord of the universe. He took his work seriously because he did it under the light of eternity in reverent love of the One to whom he was graciously bound. His feet always swiftly carried the Gospel of Christ and His kingdom, glorifying Christ and not himself or his denomination or his race or his nation. As one preacher noted, to take Christ out of Taylor’s preaching would kill it. Christ alone had the preeminence. Hallelujah! How befitting that Taylor would slip from his mortal coil on Resurrection Sunday 2015, that high and holy day when the saints celebrate Christ’s victory over death, hell, and the grave. I have come to the sobering truth that though the Rev. Dr. Martin Luther King, Jr., is rightly the most celebrated “authentic spiritual genius” produced on American soil (Taylor’s words of his friend), it is Dr. Taylor who may be our greatest Gospel herald. With poetic and prophetic imagination he always pointed us back to the Jesus of the Gospels. The historical Jesus of Nazareth whose incarnation, miracles, parables, and neighbor-love as recalled on the pages of the New Testament is the Christ of faith who came alive in Taylor’s faithful exposition of Scripture. This Jesus, Mary’s baby and God’s only begotten Son, saves sinners and calls out the falsehood of religious and political structures vying for God’s throne. Taylor surely said with Paul, “Him we proclaim.” (Col. 1:28) Nothing else mattered without its revolution around the eternal Word, the Light of the world. Dr. Taylor’s passion for prophetic justice, academic training, and the meeting of human needs found definition and purpose in his deep love of the Christ who first loved him. 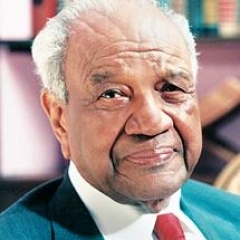 Dean Taylor was almost a centenarian when he died at the age of 96. Though I never met him, I imagine that he was wealthy in wise interpretations of the times and seasons in which he was blessed to live, struggle, and triumph. But I get the sense that he interpreted his history, and the history of the world in which he sojourned, through the prism of the Gospel. With eyes illumined by the Holy Spirit he saw the Triune God at work and was driven to commit his all to a kingdom that is not of this world. He died the way he lived: enraptured in the just love of Jesus. There is something attractive about this humble, Christ-shaped vision for life and ministry, one that is needed, I believe, so much more in our times when extremes on the Left and the Right dismiss the full portrait of the biblical Jesus. Much of our preaching today majors on minors and no longer anchors its hopes in the Lord Christ. But the One who knew Gardner by name, called him to Himself, radiates still in the Church among her fallible proclaimers. The Gospel that came alive on Gardner’s golden tongue is that same timeless Word of hope for times like these. And it is this Gospel, the whole counsel of God mediated through biblical revelation, that still offers the world the best way out of isolation, depression, injustice, and purposelessness. The Gospel is still the power of God unto salvation to those who believe. May 15, 2015 marks my 33rd birthday. Birthdays are always times for reflection and gratitude. This year I look backward with praise for my history and look forward with expectation to my destiny. Below are two segments of my spiritual biography prepared as part of my admissions requirements for Wesley Biblical Seminary’s Doctor of Ministry. As you read the words I hope you will get to know a little more about my faith, family, and formation. I pray it blesses you. My parents divorced when I was six and their separation left an emotional void that God filled later on in young adulthood. But by His grace, the Lord hovered over my life, like He did over the primordial universe, long before then and gave it shape and substance. Though tragic, the divorce did not keep my parents from contributing to my formation. In retrospect, I know God was working all things together for my good (Ro. 8:28). My mother reared me to be strong in spite of the divorce or other vicissitudes. At about age one she dedicated me back to God, and from the divorce on she read Psalm 91 over me, always reminding me that our trials are great and that our God is greater. She taught me to aspire to the greatness not allowed to her, a brown-skinned woman born poor in Jim Crow Mississippi. The spiritual covering of Psalm 91 would confirm for me God’s constant, providential presence even in those adolescent years when skepticism was more attractive than blind faith. My dad taught me thrift, the need for a solid education, and not to hate white people, no matter how much some of them did to us to keep us down. From the second grade on my best friend was a white boy from a poor family, and I believe my dad’s cosmopolitan respect led to our brotherhood. Both my parents instilled old school values of delayed gratification, knowing that hard work, resilience, and social justice could make our lot much better. They never let me feel hopeless because we grew up black and in relative poverty. And though they weren’t consistent churchgoers, my parents’ traditional nurture and discipline conditioned me to love God and neighbor beyond society’s bigotries. I wasn’t a fan of church growing up, and I often faked illness on Sunday mornings hoping to excuse myself from the chore of going when we did. God had a sense of humor. In July 2000 I received the call into the Gospel ministry. This life-altering experience occurred two months after I graduated from high school and as I was preparing to leave home for undergraduate studies at the University of Mississippi. This call, as dramatic as it was daunting, came to a very sheltered eighteen-year-old anticipating personal freedom away from the all-seeing eye of his mother. Ministry was the farthest thing from my mind—and from my parents’ hopes. When I reluctantly shared the news with them they responded with cynicism and disappointment. Mother wanted me to pursue a lucrative career so I would be able to take care of her in her old age; dad, a civil rights attorney, surely desired for me to become a lawyer like him and one day take over his practice. And neither of them were fond of preachers; the ones they knew were disliked for either their lack of education or for their love of filthy lucre. My parents’ disbelief and disappointment, and my own concerns for freedom, caused me to question my calling for a few months. But God reassured me through the prophetic words of men and women of God, and most powerfully through the Scriptures. There it was confirmed that I was sanctified unto the Gospel and consecrated to prophetic witness before I was formed in my mother’s womb. The Lord knew me, had shaped me, and destined my purpose (Jer. 1:4-10; Gal. 1:15). I could do nothing else. Under the spiritual mentorship of Bishop Arnold Stanton, pastor/founder of New Life Cathedral of Worship in Hazlehurst, Mississippi I initiated a life of devoted witness to the Gospel. I am grateful that I did. As I matriculated through the University of Mississippi, the Lord allowed me to co-found three college ministries. The first one was with a group of charismatic and Pentecostal students and together we hosted weekly bible studies, offered prayer and deliverance, and promoted Gospel music ministry. It was there that I first exercised my ministry gifts consistently. I also founded a short-lived Sunday worship service for students unable to travel off campus for church. Lastly, I helped develop a midweek bible study populated primarily with track and field athletes and new converts to Christ. Off campus I was an associate minister to youth and young adults at Clear Creek Missionary Baptist Church and Mt. Hope Baptist Church, respectively. My weeknights and Sunday mornings were filled with prayer, praise, and preaching. As a Philosophy major and as an agnostic in my teens before coming to faith in the Lord Jesus Christ, I was sympathetic to questions raised by college colleagues and professors, an understanding that followed me into the next stages of my journey. I graduated in 2004 and thereafter briefly served as religious affairs coordinator with Free the Slaves, a Washington, DC-based abolitionist nonprofit. I united my passion for social justice and ministry, recalling both my admiration for Dr. Martin Luther King, Jr. and my introduction to Liberation Theology through the university’s library. Again I encountered skepticism from those I worked with. Articulating my evangelical faith and how it fueled my passion for justice made little sense to activists who saw the institutional church as possibly the greatest purveyor of oppression. I understood their consternation and knew many churches had to repent and be renewed so that they could more graciously witness to the love and holiness of our Triune God. Questions from my youth and from those skeptics I met, loved, and worked with stirred my theological imagination. Problems of race and faith, of nominal Christianity, and of powerless preaching haunted me. I wanted both the learning and the burning, the demonstration of the Spirit and the explication of sound doctrine, in order to bear witness to a Gospel that transforms in a culture increasingly dismissive of it. God led me to Duke Divinity School in 2006 where many of those questions were answered and many more formed. In that same year, while on a spiritual retreat, the Lord said that I was to return to Mississippi following my graduation because He had a great work for me to do. I resisted, much as I did with His call into the ministry, but the commission was unshakable. Lessons learned in the classroom, as an intern with Duke Divinity’s Goodson Chapel, Wake Chapel Church, and Wake Medical Hospital, were foundational for the labor I would later commit my head, hands, and heart to in Jackson. Duke taught me how to think about contemporary issues with the grammar of the Orthodox faith; my internships helped me do this pastorally, in and for the Church. Affirmed in my evangelical-Baptist faith, Pentecostal experience, and introduced to Eastern Orthodoxy, I embraced a generous orthodoxy that I yearned to share with my native land. I came back to Mississippi seized by God’s mission, and many obstacles could not deter me from fulfilling that mission to God’s glory. I had several opportunities to serve around the country after graduating from Duke. But in obedience to God’s directive I returned to Jackson in 2009. God opened a door for me to work for Mission Mississippi. Among other opportunities, I was able to meet with black and white pastors from around the state as we sought to build an interdenominational racial reconciliation movement. Licensed into Gospel ministry at New Life Cathedral of Worship of Hazlehurst, and ordained in 2009 Cornerstone Church of Durham, North Carolina, my devotion to the global Church, in all its diverse manifestations, was evidenced through my short tenure there. Meeting Christians of different races, ages, and denominations reinforced my discernment that what God called me to was bigger than the boxes we construct. Mines was and is a ministry of convergence, where different streams of the global Church meet in transformative love and serve as a glimpse into the new creation of God. In 2010 I was called to serve as youngest pastor of Mt Helm Baptist Church, Jackson’s oldest historically African-American congregation. During this time Mt Helm regained its status as a flagship church, became more engaged in evangelism and advocacy, and modeled adaptive paradigms that made the nearly two century old church more relevant and visible. In 2014 Helm Place, an 88-house community development, broke ground. Denominationally, regularly teach in the State Congress of Christian Education of the General Missionary Baptist State Convention, and in June 2014 I was appointed President of the Mississippi Baptist Seminary and Bible College, a part-time ministerial enterprise. 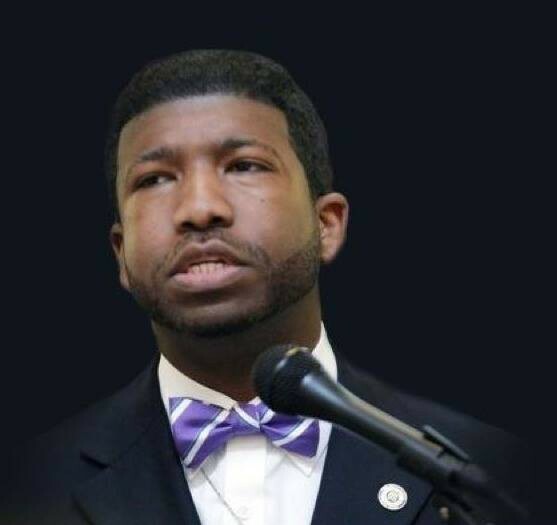 In September 2013 I became the Rector of the historic Oakland Memorial Chapel and Director of Student Religious Life at Alcorn State University. There I facilitate weekly worship services, oversee campus ministries, and teach Introduction to Ethics. I also host of The CJ Rhodes Show on WRBJ 97.7 FM and am the author of Thy Kingdom Come: Reflections on Pastoral and Prophetic Ministry. In 2013 I was one of fifty persons selected to participate in the Inaugural Institute of Black Theology and Leadership at Princeton Theological Seminary, where we engaged in theological and leadership concerns for and within black congregations and communities. A family man, I am married to Allison, and together we are committed to glorifying God and raising our twin sons, Carroll III and Cornelius Josiah.